There are tons of great restaurants in the Bay Area. San Francisco is known for its world class cuisine, so choosing a place to eat can be a hard decision to make. There are so many different types of cuisine to choose from that what to eat could be as simple a decision as where you are in the city. The Van's located in Belmont on the Peninsula. The Van's has been a Bay Area tradition since 1947. It offers a fabulous view of the bay as it is situated on the Belmont hillside. The Van's offers a variety of menu options, but features some excellent Italian dishes. The food is good and the service is attentive at The Van's. If you choose to dine here, I definitely recommend reservations. I love Italian food, and there are many great Italian restaurants in the Bay Area. One of my favorites is La Tosca in San Carlos. La Tosca is a small neighborhood restaurant located in the town center of San Carlos. It is on a street lined with other local restaurants and small shops. It offers intimate dining, outstanding food, and excellent service. They also offer live music a couple of nights a week, adding to the romantic ambiance of the restaurant. La Tosca was recently voted one of the Top 10 Bay Area Italian Restaurants by diners on OpenTable.com, an online restaurant reservation service. Use OpenTable.com to make your reservations, especially on the weekend. Another Italian dining gem is located further down the Peninsula in Palo Alto. Osteria is another small neighborhood restaurant with excellent food and attentive service. The ambiance is a little more energetic than La Tosca, but enjoyable nonetheless. Reservations are a must at Osteria, even during the week. Okay, so the Elephant Bar is a chain, but an interesting one featuring Pacific Rim cuisine and good service. I've eaten a couple of times at the one in Burlingame on Old Bayshore Highway (near SFO...you can seen the planes take off and land). The food is all made fresh and they do go out of their way to make sure you leave happy. On a visit there, I ordered a Mahi Mahi sandwich with a fruit based salsa. I didn't like it and barely ate any of it, but I did eat my french fries (potatoes are my favorite food.) When the server came to check on us, he noticed that my sandwhich was barely touched. He offered to get me something else, I said he didn't need to as it was my fault for not liking what I ordered (I don't think I'd had Mahi Mahi before, so it was the taste of the fish). The server insisted and I opted for the veggie burger (a much better choice and what I should've gotten to begin with). The veggie burger came out quickly and with fresh fries (double fries, score!) We also didn't get charged for the first burger I didn't like, which I totally was not expecting...so the server got a big tip. The decor of the Elephant Bar is interesting, it's jungle oriented...but not at all Rainforest Cafe. Fish and Chips from Neptune's Palace. View from Neptune's Palace at Pier 39. 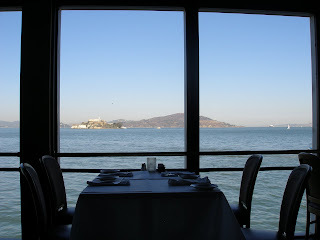 As I've mentioned in other posts, I like eating at Neptune's Palace at Pier 39 in the city. There are so many other great restaurants to explore I'd like to be able to try a new one each trip, but that doesn't always work out. 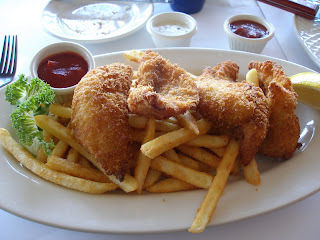 While I do eat seafood on occasion, I try to stick to a vegetarian diet. So, on one of my trips to the San Francisco I really wanted to try the famous Greens vegetarian restaurant. My boyfriend took me there for my birthday lunch...he's not a vegetarian, so I appreciated him taking one for the team by eating a meatless meal. Greens is located at Fort Mason in the marina district of San Francisco...it has a great view, as do many of the restaurants located along the water. I must say, I was somewhat disappointed by my meal...the food didn't live up to the hype, although the presentation was very good. Although it was not a bad meal...it just wasn't a fantastic one, either. I wouldn't rule out trying it again, although it might be a tough sell getting the BF there again. There are many other vegetarian restaurants in the Bay Area, so Greens is not the only option. Remains of lunch at Greens. When visiting the Bay Area I do try really hard not to eat at chain restaurants; however, sometimes it can't be helped. Definitely go out and explore the neighborhoods, because you never know what great places you may find to eat.